Over the past half-century, women have strengthened their position in the labor force and boosted their economic standing by making gains in labor force participation, wages and access to more lucrative occupations. But their progress on some fronts has stagnated in recent years, and large gender gaps persist at the top levels of leadership in government and business. Here are some key findings about gender gains and gaps in America. 1 Women make up 47% of the U.S. labor force, up from 30% in 1950 – but growth has stagnated. 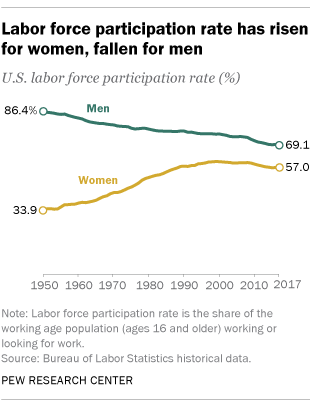 The share of women in the labor force generally grew throughout the second half of the 20th century, but it has since leveled off. 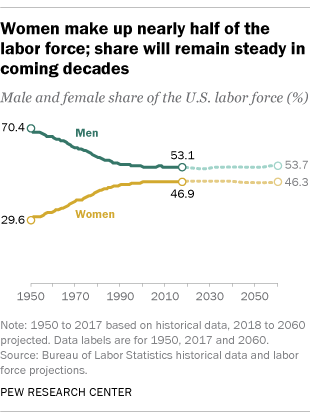 Projections from the Bureau of Labor Statistics indicate that in the coming decades women will continue to make up slightly less than half of the labor force. 2 Women have seen steady growth in labor force participation over the past several decades, but that too has leveled off. In 2017, 57% of working-age women (ages 16 and older) were either employed or looking for work. That’s higher than it was in 1980 (51%) but down somewhat from its peak of 60% in 1999. One of the main drivers of increased labor force participation among women over the decades has been the sharp increase in the share of mothers in the workforce. Nearly three-quarters (73%) of mothers with children younger than 18 were in the labor force in 2000, up from 47% in 1975 (the first year for which data on mothers’ labor force participation are available). That share has remained relatively stable since about 2000. Men’s presence in the labor force has been on the decline in recent decades. In 1980, 77% of working-age men (ages 16 and older) were employed or looking for work; in 2017, 69% were in the labor force. 3 Growing wages for women have helped narrow the gender pay gap, though women still lag men in pay. Women’s median hourly earnings were $16.00 in 2016, up from $12.48 in 1980 (after adjusting for inflation). 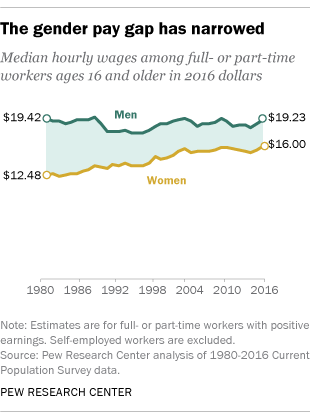 Men earned a median hourly wage of $19.23 in 2016, down slightly from $19.42 in 1980. In other words, in 2016, the median working woman earned 83 cents for every dollar earned by men, compared with 64 cents for every man’s dollar in 1980. For workers ages 25 to 34, the wage gap is smaller: In 2016, women in this group earned 90 cents for every dollar a man in the same age group made. White and Asian women have narrowed the wage gap with white men to a much greater degree than black and Hispanic women. Women’s increasing wages have been driven in part by their increased presence in more lucrative occupations. For example, women today are just as likely as men to be working in managerial positions. In 1980, men were twice as likely as women to have these types of jobs. 4 Women have made gains in educational attainment, which has contributed to their progress in the workforce at large. Among adults ages 25 to 64, women are now more likely than men to have a four-year college degree. In 2017, 38% of these women and 33% of men had a bachelor’s degree. Women are also outpacing men in postgraduate education. In 2017, 14% of women ages 25 to 64 had an advanced degree, compared with 12% of men. In 1992, a higher share of men (9%) than women (6%) in this age group had an advanced degree. 5Women still lag in top leadership positions in business and government. Women have made inroads in a wide range of leadership positions in recent decades, but they only account for about 20% of members of Congress and about a quarter of state legislature members. Women made up roughly 5% of Fortune 500 company CEOs in the first quarter of 2017 and about 20% of Fortune 500 board members in 2016. As of March 2018, there are six female governors and five females in executive branch cabinet-level positions. Most Americans say women are equally as capable of leading as men are. But many say there aren’t more women in top business or political positions because women are held to higher standards than men and have to do more to prove themselves (43% say this for business positions, 38% for political offices). Similar shares say the electorate and corporate America are just not ready to put more women in top leadership positions. 6The role of women as family breadwinners has grown dramatically in recent decades. In 2014, women were the sole or primary financial provider in four-in-ten households with children younger than 18, up from 11% in 1960. Today, 31% of women who are married to or cohabiting with a male partner contribute at least half of the couple’s total earnings, up from just 13% in 1980. But men earn more than women in 69% of married or cohabiting couples. Despite the increase in women’s financial contributions, roughly seven-in-ten adults (71%) say it is very important for a man to be able to support a family financially in order to be a good husband or partner. Just 32% say it’s very important for a woman to do the same to be a good wife or partner. 7Working women are much more likely than working men to say they’ve faced gender discrimination on the job. Women are about twice as likely as men (42% vs. 22%) to say they have experienced at least one of eight specific forms of gender discrimination at work. One-in-four working women (25%) say they have earned less than a man who was doing the same job, compared with just 5% of men who say they’ve earned less than a female peer. Women are also about four times as likely as men to say they have been treated as if they were not competent because of their gender (23% of women vs. 6% of men), and they are about three times as likely to say they have experienced repeated small slights at work because of their gender (16% versus 5%). 8The public is divided over whether the country has made adequate progress in giving women equal rights with men. Half of Americans say the country hasn’t gone far enough, 39% say efforts on this front have been about right and 10% say the country has gone too far. While more than half of women (57%) say the country hasn’t done enough to give women equal rights with men, men are split between saying there is more work to be done (42%) and that things are about right (44%). Men and women have different perspectives on how far the country has come in achieving gender equality, but this gender gap narrows when partisanship is taken into account. Among Democrats and Democratic-leaning independents, a majority of women (74%) and men (64%) say the country hasn’t gone far enough when it comes to achieving gender equality. And while Republican and Republican-leaning women are more likely than their male counterparts to share this view, relatively small shares of each group do so (33% of women vs. 20% of men).